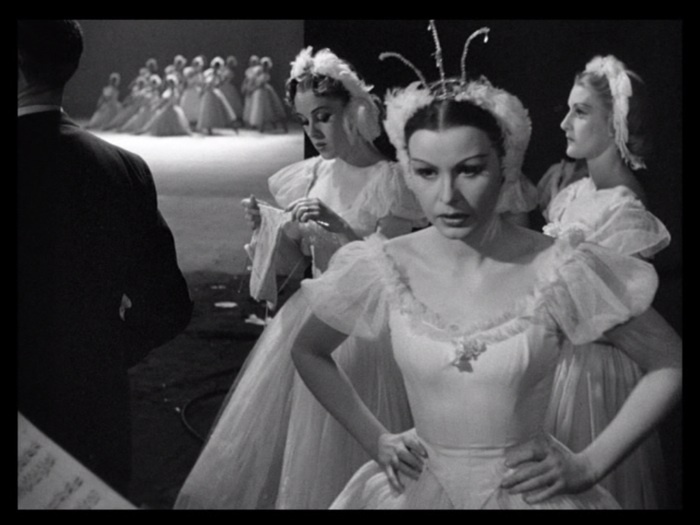 May the Fourth: Ooh La la! 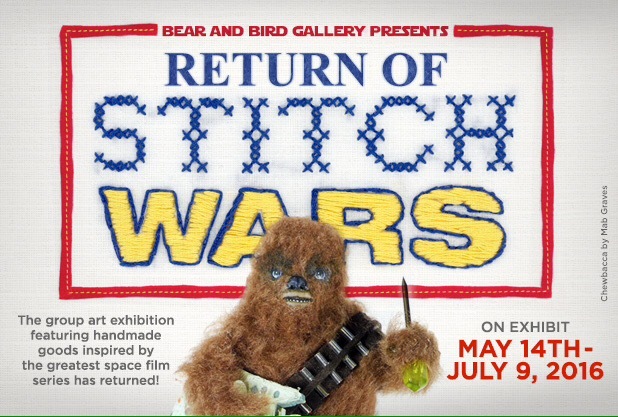 Recently, in a galaxy relatively close in proximity, I was asked to participate in Bear and Bird Gallery‘s upcoming Stitch Wars exhibition (opening May 14th in Lauderhill, FL), an art show where fiber artists give their yarny interpretations of various Star Wars characters. I knew almost immediately who I wanted to recreate: Oola, Jabba the Hutt’s personal Twi’lek slave dancer from Return of the Jedi who meets her fate in the cavernous lair of the Rancor. What can I say? I have a thing for green ladies. Oola has poseable arms and legs, comes with her own chain and stands about 17.5″ tall (although figure does not stand on its own). 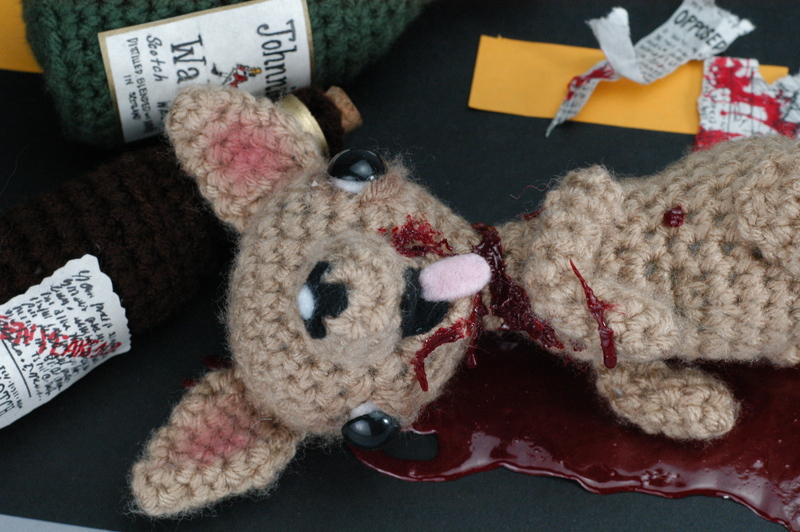 She will be on sale during the run of the show, May 14-July 9, alongside other wonderful fibrous creations from many talented and nerdy artists! I also have new pieces available for sale this year! 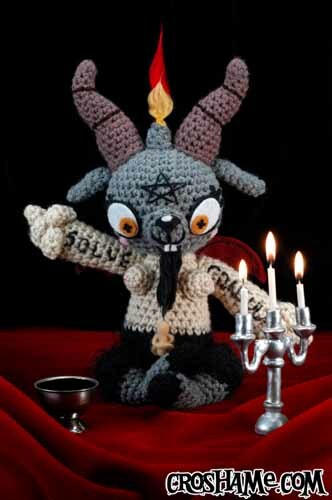 Feeling like you need some Krampus in your life… but just a little bit? 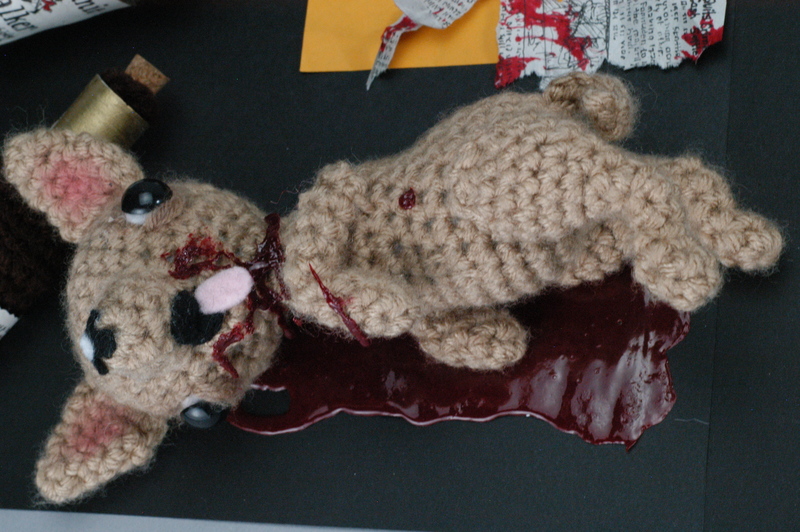 Like, maybe a decapitated head’s-worth, just to cheer up the atmosphere? 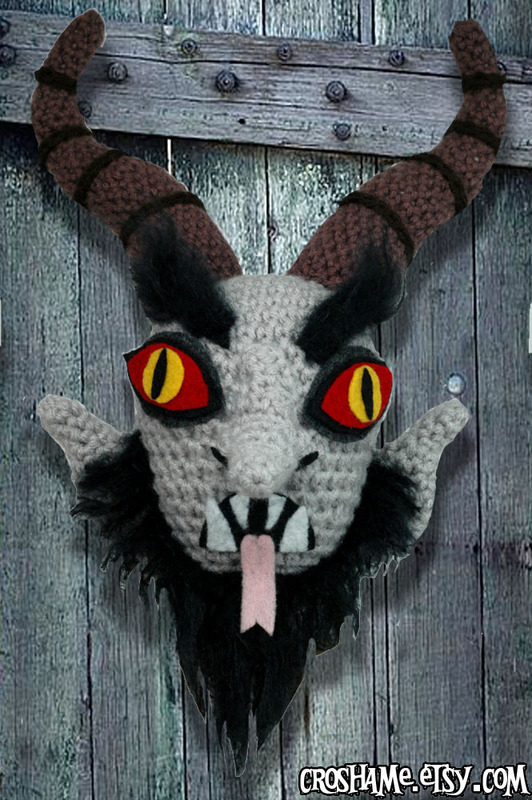 Well, there’s the Krampus Door Hanger! 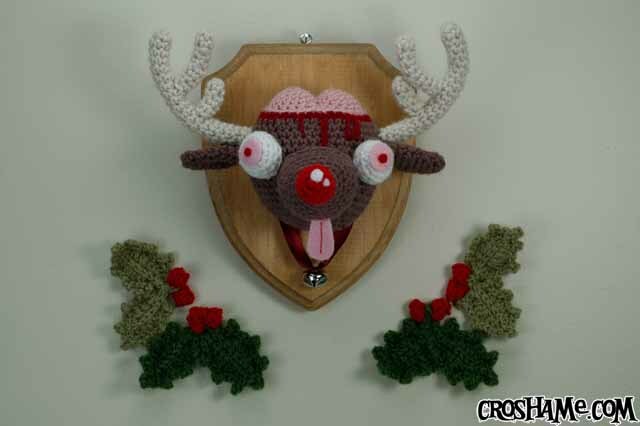 He comes with wire strung into the back of his head, making him perfect for hanging on the door, on the wall, or if you prefer, directly over the baby’s crib. Iddin’t he kewt? Gods bless us, every one! 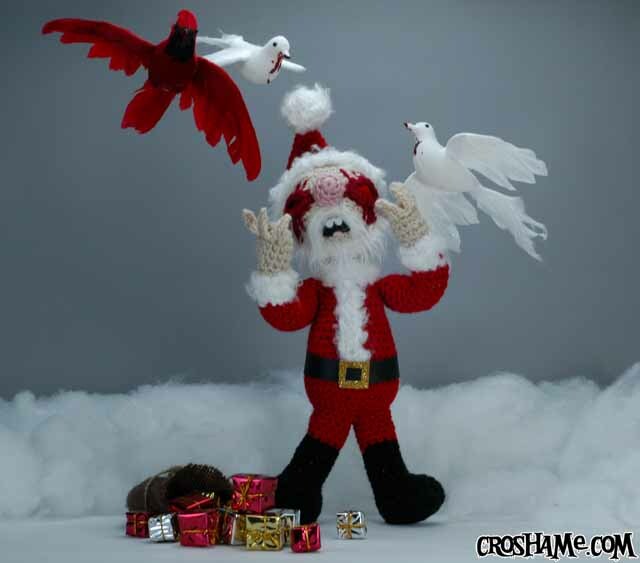 And let us not forget our olden holiday friends from times past. Like silver and gold, they are! Hey everyone! 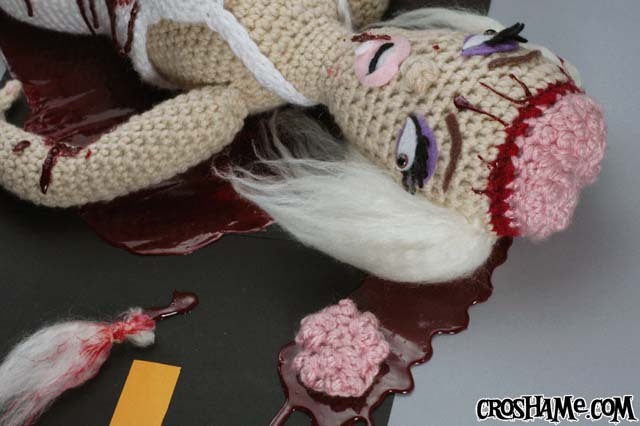 The Croshame Etsy store is now back up and running for all your misanthropic crochet and antigurumi needs. Throughout the month of September and October use the coupon code “GGWHIZZ” at checkout for 10% off your purchase! 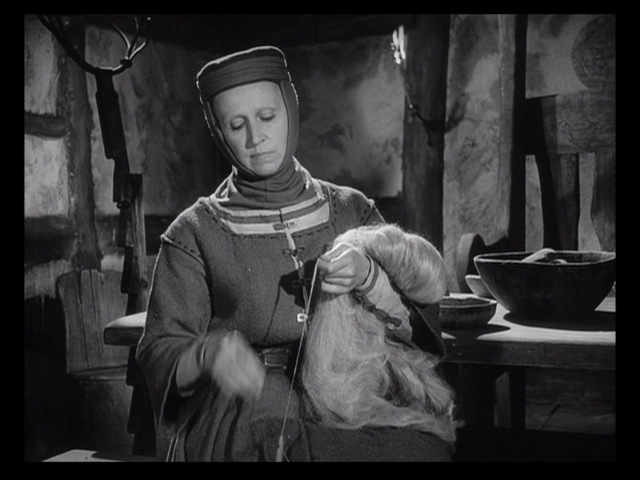 This week’s stills are from yet ANOTHER Ingmar Bergman-directed movie, Jungfrukällan, AKA The Virgin Spring (1960). This gem inspired two other great (but less subtle) films, Last House on the Left and I Spit on Your Grave. 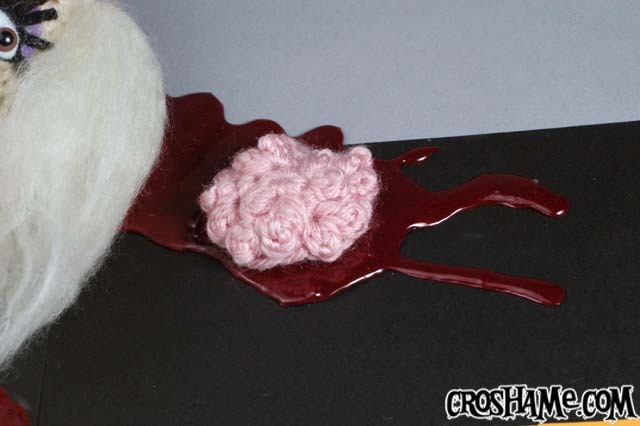 It also inspired this week’s Movie Still Monday post with its sweet drop spindle action! Spinning wheel? Bah. That is so 11th century. 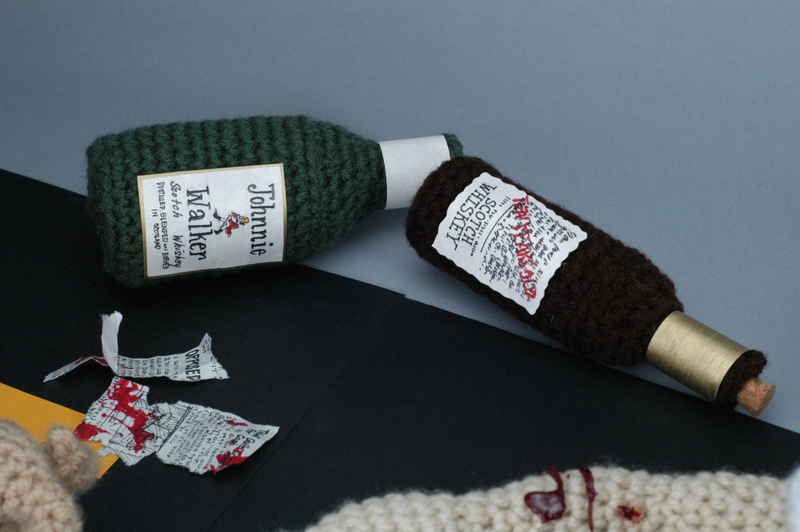 This was the only way to make yarn back in the day. Being a hand-spinning spring virgin myself, I couldn’t really tell you exactly what she’s doing here. But actress Birgitta Valberg definitely looks like she knows what’s going on! Multitalented or merely a consummate thespian? 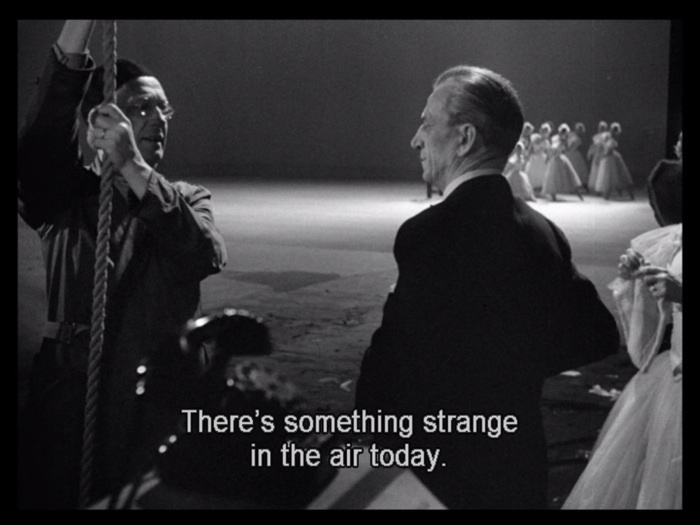 This week’s set of stills comes from Ingmar Bergman’s 1951 film Sommarlek, AKA Summer Interlude. You said it, dude. Just look off to your right a little and you’ll find out why! 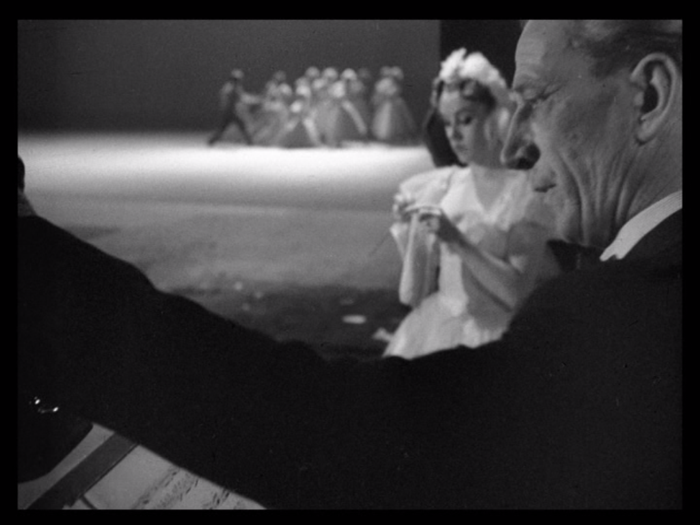 Ah yes, there she is, a knitting ballerina — something strange indeed. Well, she’ll have put down her WIP to go out on stage in a minute. Bummer! 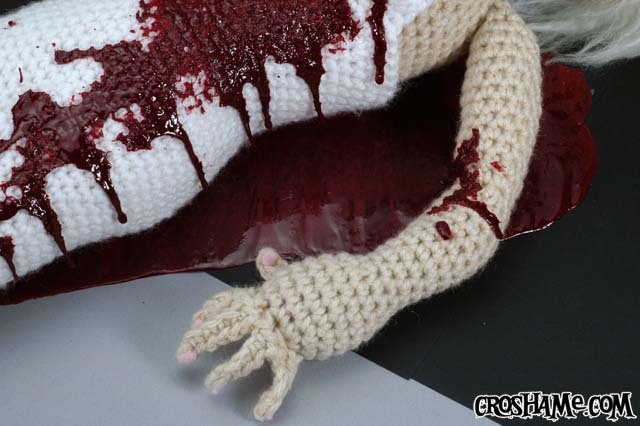 Better stop and count those stitches before she has to frog the whole damn thing; now THAT would be a tragedy! After going through one of the most grueling winters of my existence, I’m anxious to celebrate summer — even if it’s not technically starting until the 21st. That’s right, Mr. Sun! A sale! 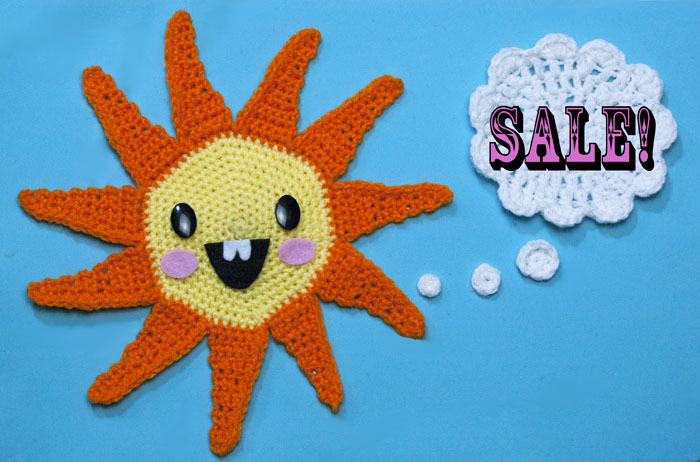 During the month of June, anyone who uses the coupon code “SUMMERSALE” at checkout in the Croshame Etsy Store will receive 20% off ANYTHING in the whole dang shop (commission work excluded)! The sale ends on June 30th and the store will be temporarily closing for at least a few weeks shortly thereafter , so make sure to take advantage of these sweaty, hot deals during this month only! 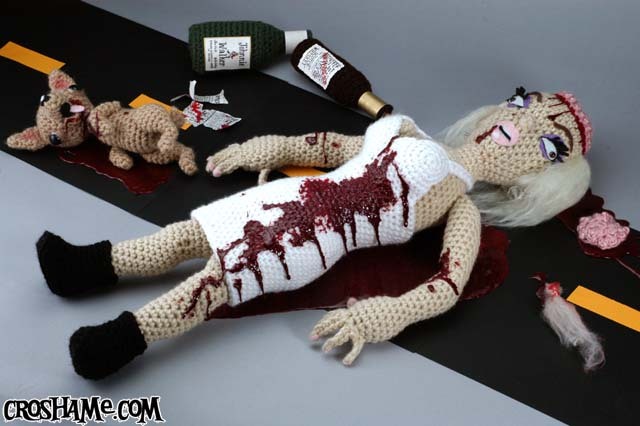 Ever since I first started crocheting, I’ve wanted to do a recreation of actress Jayne Mansfield’s death (because after all, horrific crime scenes are only a natural progression from granny squares). So when I recently received a commission request with that very scenario as a possibility, I jumped at the chance to complete my morbid goal. The details of the death as most people know it were sensationally chronicled in director/writer Kenneth Anger’s Hollywood Babylon, accompanied by some rather gruesome — some would say staged — photos. Having only these and other grainily suspect photos to go on (a seemingly frequent occurrence for Croshame pieces), I decided I would probably have to make the majority of the exquisite corpus delicti up, based on the available research and information. 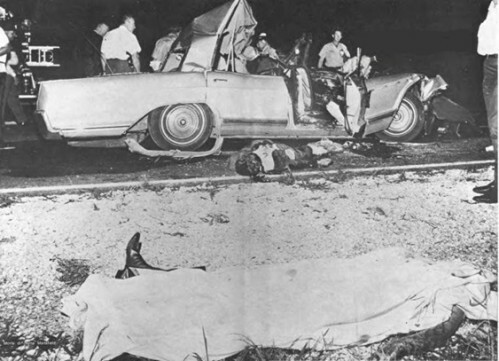 Below is the tragedy that followed. 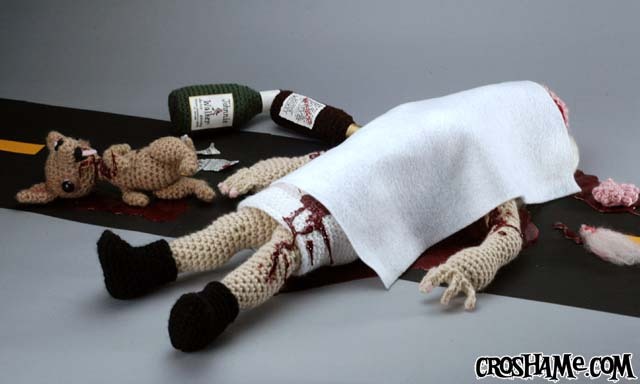 According to popular myth, Jayne was fully decapitated — but not true, sayeth the coroner’s report. Cranial avulsion does not a decapitation make! Jayne was not only traveling with a driver, her lawyer-boyfriend, and her three children, but also with four (that’s right, four — two of them allegedly unpaid for) chihuahuas in the car, two of which perished in the accident. I made the one featured in this photo from Hollywood Babylon. According to the existing photos, there were two very large (unopened?) 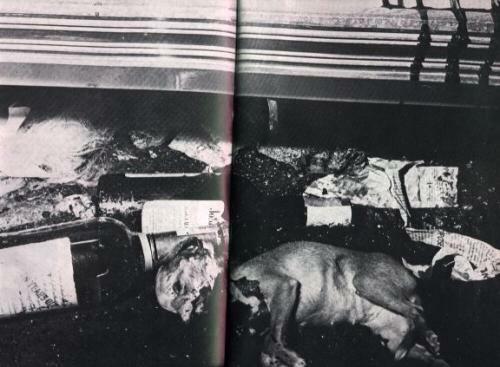 bottles of alcohol in the car, as well various other detritus spilled around the scene of the crime. The devil, as they say, is in the details. Using my top-secret formula, I concocted some beautiful fake blood. Can one ever have too much? Naaaahhh.